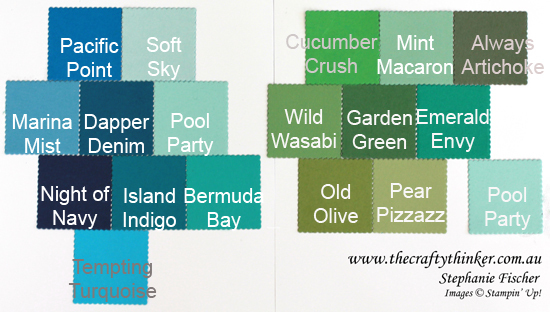 As a little exercise for myself, whenever new colours are added to the range, I make up little colour boards to help me understand their place in the collection and how the hues and tones will work with each other. 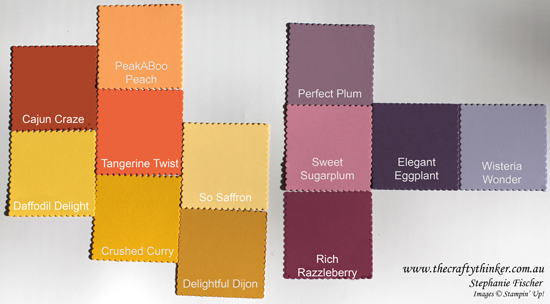 These are my most recent colour boards. Pink / Red colour board incorporating the new In Colour, Flirty Flamngo. I guess you know you've reached a certain age when you start needing more sympathy cards than any other kind of card. Yet another of my dear friends has suffered the loss of a parent. My friend lives in Queensland and loves tropical plants, so I'm hoping this card will bring her a little much-needed comfort. Negative spaces can be very powerful - it just takes a little planning. I have since realised, though, that in place of the little butterfly, I should have put a little green tree frog - her mother really loved those! Easel cards are so satisfying to make and so nice to receive! 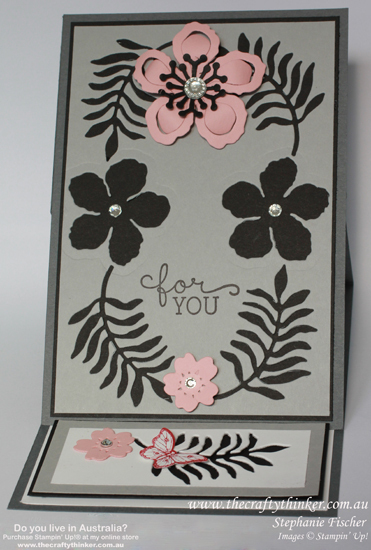 This is a 6" x 4.5" easel card made with Basic Gray cardstock and layered with Basic Black and Smoky Slate cardstock. 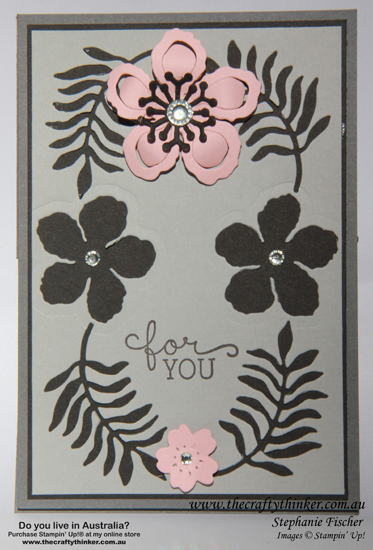 The leaves and flowers that appear black are negative spaces cut with the Botanical Builders dies from the Smoky Slate cardstock so that the underlying black cardstock shows through. 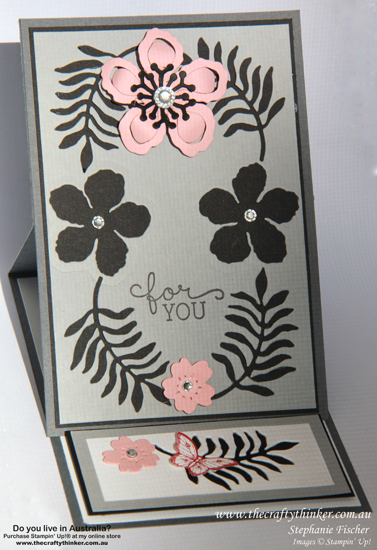 The pink flowers are cut with the Botanical Builders die and one of the flowers in the Bloomin' Heart Thinlits set from Blushing Bride cardstock. 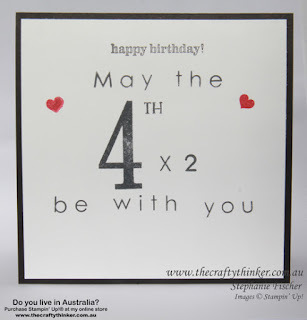 The sentiment is from the Birthday blooms stamp set. The butterfly is stamped in Rose Red ink on Whisper White with one of the Papillon Potpourri stamps and punched out with the matching Bitty Butterfly punch. 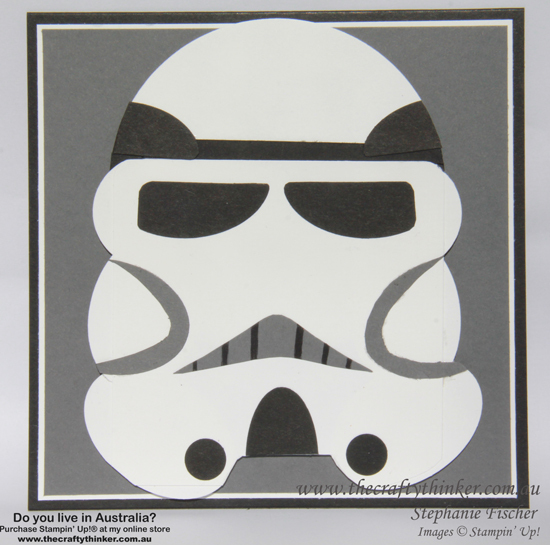 I wanted to make a special birthday card for one of my Great-Nephews and at the moment he really loves Star Wars Stormtroopers! So I decided to have a go at creating one with punch art! The first thing I did was to Google images and then I made a little sketch and started looking for shapes that I could punch. My sketch plan and calculations! I decided what size I would like the finished piece to be and worked backwards from there to determine sizes for the elements. The first size I chose was the diameter of the circle for the top of the helmet. 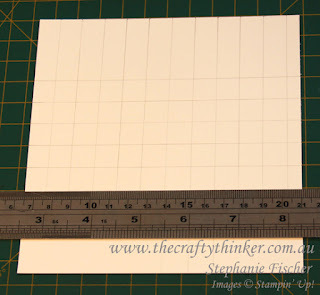 That gave me the dimensions for the square that I cut and round cornered and to which I glued all the pieces. I've included a photograph of the back of the piece that shows the punches I used and how I attached them. Also included in that photo are the shapes I used for the grey and black pieces. The only pieces that I didn't photograph are the thin strip of black cardstock between the top of the helmet and faceplate and the nose piece, which I ended up hand cutting! 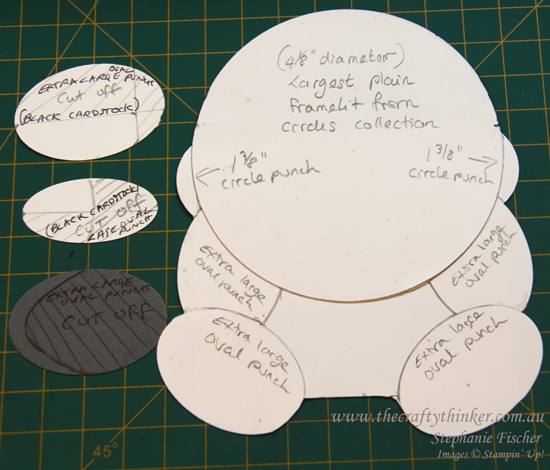 I used my snips to round off sharp corners when I cut the eyes from the oval punched shapes. I used a 1/2" circle punch for the black circles on either side of the mouth piece. 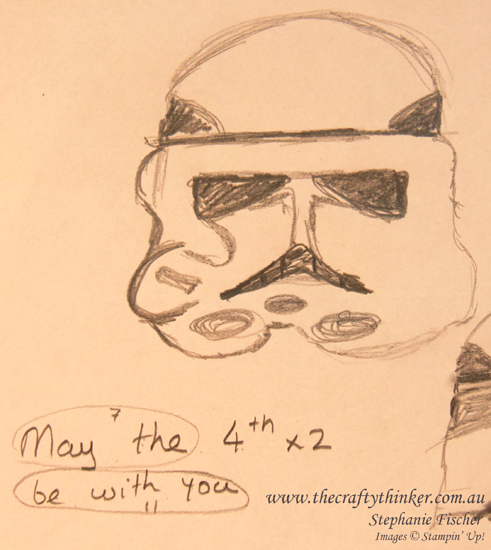 For the inside of the card, I thought of that old chestnut "May the 4th be with you" and made a play on that. When positioning the letters, I lightly drew a grid with a pencil to help determine what I'd be able to fit on a line as well as to help line it all up and centre it. The photopolymer stamps really helped with this process! The Happy Birthday greeting is from the stamp set Boys Will Be Boys, the number "4th" is from Number of Years and all the remaining letters and numbers are from the Back to Basics Alphabet. The hearts were from Another Thank You and I stamped them in Real Red. Can you guess his age? The black card base is 5 1/2" square (5 1/2" x 11" scored at 5 1/2"). The white layer is 1/4" smaller at 5 1/4" and the Basic Gray layer is 5 1/8". It was a bit of a learning experience and, if I did it again, I would know to pay closer attention to symmetry and would reduce the length of the "face" a bit. The oval punches are retiring on 31st May but I think the new Layering Ovals Framelits will provide suitable shapes.